I have a confession to make: my boyfriend and I not only watch Masterchef Junior, we cry at the end of almost every episode. Really. My man and I hold each other and whimper as a—dimpled, shiny-eyed, sometimes bow-wearing, often better dressed than most adults we know—child gets sent home from the competition when her or his culinary creation doesn’t quite meet the mark. This is where I first became familiar with Christina Tosi, the Masterchef judge with a Cheshire smile and insatiable sweet tooth. When I tell her that Masterchef Junior hits me in the core of my heart, she assures me that the kids who leave “quickly bounce back.” And I believe her. Tosi is the founder and brainchild behind Milk Bar, a dessert company that celebrates its 10 year anniversary today, November 15th—and one that changed dessert culture in New York before changing dessert culture everywhere. Tosi got her break working at New York City fine dining restaurants Bouley and wd~50, the latter of which became a trial ground for many of the desserts that live on Milk Bar’s menu now. But it wasn’t until she met and partnered with Momofuku restaurant group’s David Chang that the seeds for Milk Bar as we know it were sown. (If you haven’t watched her episode of Chef’s Table, the time is now.) Tosi’s creativity and relentless desire to upend tradition when it comes to classic desserts (chess pie became crack pie; leftover cereal milk became a non-disposable ingredient; birthday cakes debuted naked before the naked cake trend existed) paid off—Milk Bar is a veritable pastry empire, with 15 locations and counting across the U.S. and in Toronto (a Los Angeles flagship store opened on Melrose Avenue in 2018). 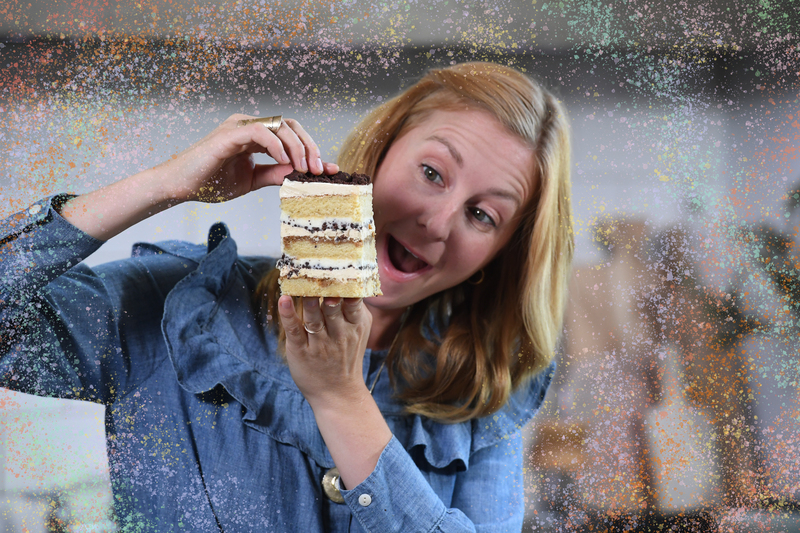 I caught up with Tosi to learn more about her new partnership with Folgers coffee (just in time for holiday baking season), her most nostalgic flavor memories, and how inclusivity factors into her brand and baking philosophy. Nicole Adlman (NA): What is your favorite holiday food or flavor memory? Christina Tosi (CT): We have a tradition in my household where cinnamon buns magically appear early in the morning, the morning of every holiday. And I started taking over the responsibility when I was a teenager and honing in on my most beloved cinnamon bun recipe. I knead the dough late at night the night before and make the gooey filling and roll it all up and get it ready, and then I set my alarm for the wee hours of the morning, five or six a.m., to pull them out, let them proof. And then I’d bake them, and the smell of freshly baked cinnamon buns waft throughout whatever house I am in. And I goo on that cream cheese frosting and it pulls everyone out of bed, they get their nice pot of coffee poured into cups, and everyone just kind of goes crazy over these cinnamon buns. And that is long before we start to think about any other food for the rest of the day. NA: Did you figure out if that magical appearance was something your grandmother or mother did for you growing up? CT: I don’t actually know who started the tradition. I know that when I was, I can’t remember, I think I was 16 or 17 years old, I took over the tradition from my mom, and I said, I’m going to do it this year. And once you raise your hand and say “I’ll be the one that wakes up at six o’clock in the morning,” no one argues with you. But it is just my favorite flavor and food memory, and my favorite thing to do. There’s something about watching everyone wake up over a glorious cup of coffee and a gooey cinnamon bun. NA: Do you sell a concrete version of that nostalgia at Milk Bar? CT: We don’t, but the recipe is in Milk Bar Life, our second cookbook. We used to sell those cinnamon buns 10 years ago when we first opened Milk Bar. And then we turned it into a cinnamon bun pie. Cinnamon buns are so decadent that you shouldn’t really eat them every day; it only happens in our home on special occasions. NA: What appealed to you about the partnership and recipe concepting with Folgers? CT: Coffee and virtually any kind of dessert go hand and hand. I’m a big, crazy coffee fanatic and I live on coffee and live on cake, as you can imagine. A lot of my professional work is done by walking back on memory lane and stumbling upon the nostalgic flavors and feelings of my childhood, and Folgers coffee was a very big part of my upbringing. My dad would brew his pot every morning before he went off to work at the Department of Agriculture, and the idea of this partnership felt fun, spirited, and sort of brought me back to when I first got my start in the home kitchen. 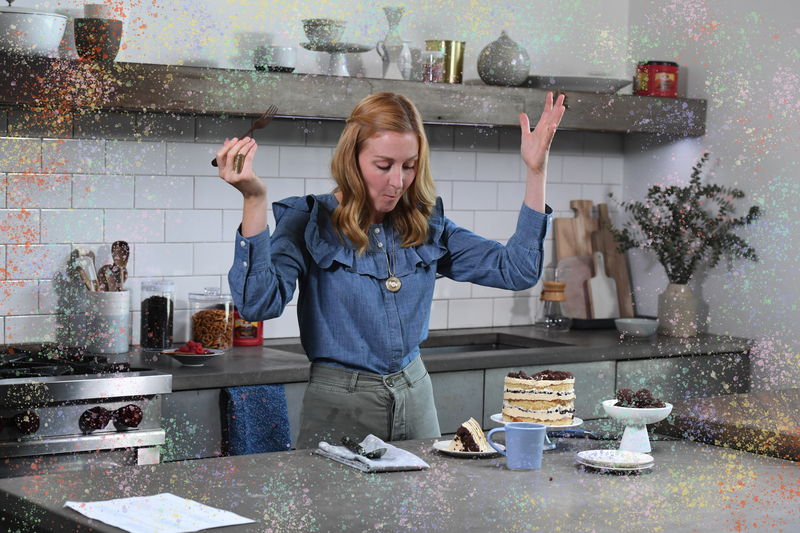 And it’s been great to talk through and think through what the perfect pairing of dessert and coffee is, or more aptly what cake and coffee look like, and to create different recipes to inspire home bakers. NA: What do you specifically love about the flavor of coffee, and what are some unexpected ways we can use coffee in baking or savory cooking? CT: So the flavor of coffee—much like some of my favorite flavors to play with in the kitchen like passion fruit and chocolate—has the ability to be so versatile. It holds creamy notes really well, it holds fatty notes really well. It can be both bitter and floral and acidic and rich and bold. There are mellow and quiet notes, depending on how you pair it or how you use it, and so it is an ingredient I adore. There’s something about…I think when you’re a cook in a kitchen first getting your start, you live on coffee. You work really long hours, you work long after everyone has gone to bed at night or long before everyone wakes up in the morning. And that relationship you have with the first sip of coffee in your day is a singular relationship. You huddle over your hot cup of coffee and it feels like a warm hug when nobody’s around. On a really emotional level and in a really sweet way, I still to this day will almost huddle over or hug my cup of coffee, even if I’m taking it on the subway to go to work. And for me coffee also celebrates the beauty of the solitary moment you have where it’s just you and the world. Either you’re going to work, coming home, or you know, baking that last batch of something or the first batch of something. And so I think you find it in a lot of sweet and savory cooking because it is both an element of a cook’s life and an ingredient that we all love because of its versatility. My favorite ways to kind of sneak it in to, to wow it into things, is to use it as a cake soak. We soak all of the cakes that we make, whether I’m at home or in the kitchen. Cake soak is a fun way to add flavor and moisture to a cake, and using an unexpected flavor like freshly brewed coffee is an extra fun way to do it. Like with my tiramisu layer cake, where I basically take a vanilla cake and dunk it in or brush it with a really bold blend of coffee that can hold a tone and make the richest, moistest dessert. I love using coffee, a teaspoon or two, when I’m making a frosting or a cake or a cookie recipe. I think it adds both great aromatic notes but also great texture. I use ground coffee in the compost cookie pound cake for example, and it provides both. If I make something like a frosting, I might add either freshly brewed coffee or instant coffee or both to add an extra zing, a zazz, a real punch of flavor. None of my desserts are a whisper of flavor. They’re all very bold and exist to hold a tone on a table. So coffee helps embolden those flavor profiles. I like it as a secret ingredient in my chocolate desserts, which enhances the chocolate flavor. It can hold both a super mild fruit tart against a nice light-bodied coffee, and it can go all the way and as wild and intense as a super rich decedent chocolate dessert paired with a dark blend. NA: I’m definitely going to get coffee after this. NA: The way you describe it makes it even better than it already is. Are there any coffee-specific desserts that are nostalgic for you? CT: Tiramisu is probably my most nostalgic coffee dessert. My father’s family is all from northern Italy and it was actually my first…I call them hand-me-downs, the recipes you get handed down from your family from a young age. It was my first hand-me-down recipe. A cousin of mine taught me how to make tiramisu when I was six by using just store bought cookies and super rich coffee overtop of it, and layering that with mascarpone filling, cocoa powder on top, and then layering that again. 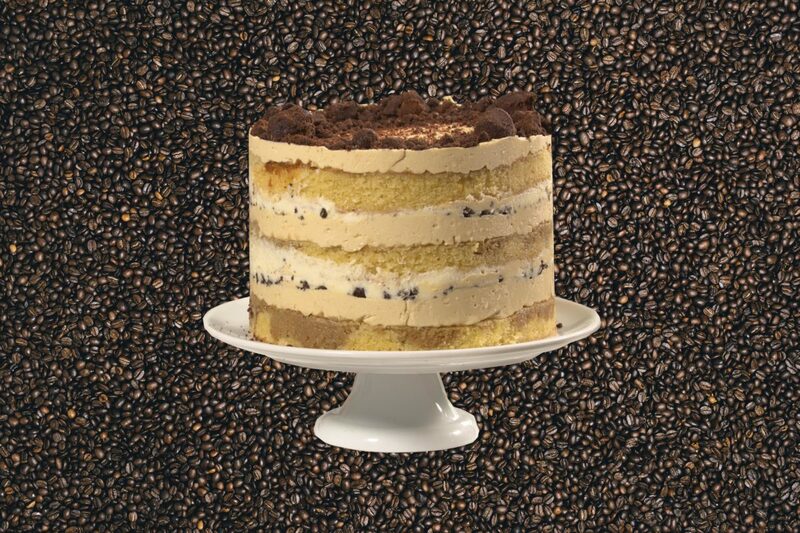 That actual coffee dessert memory is the impetus for the tiramisu layer cake that I dreamed up for this partnership with Folgers. I love a good full circle story and the tiramisu layer cake is that for me. NA: So quickly: how do you make your most ideal tiramisu? CT: My six year old version of tiramisu was store bought vanilla wafers that we would douse in rich coffee. Traditionally, it’s fresh lady fingers, which very few people have the time or stock to make these days. As long as it’s some sort of cookie or cake that is brought to life by dunking them in intense, rich coffee, you’re in a good place. The secret for me is in the strength of that coffee and the balance of that against the mascarpone. Balancing it typically involves mascarpone, or sometimes some cream cheese, some butter, some sugar. If you’ve got it, a little bit of ricotta cheese for a lightness, some vanilla extract. And then traditionally you sprinkle a bitter and intense cocoa powder over everything, but in my layer cake’s case, it’s layers of sandy chocolate crumbs and that mascarpone ricotta filling. NA: Do you consider inclusivity when you partner with a brand? CT: Yeah, of course. Ever since I started Milk Bar, my big vision was to create a place that had a sense of community and making sure that our desserts are cookies and cakes and pies that all people can access. There’s no more democratic approach to desserts than the desserts that you can hold in your hand or wrap up on a paper plate and bring anywhere you go. That’s definitely a big decision-making factor when we think about what kind of brand inspires us and that we want to be close to, and how to help inspire communities through our desserts. NA: What’s your favorite seasonal Milk Bar dessert right now? I bought my boyfriend the pumpkin dulce de leche cake for his birthday in October and it was decadent. CT: The pumpkin dulce de leche cake is key, but there are two things that are coming on the menu December 1st that revolve around chocolate and peppermint—two things that I have in my freezer and cannot get enough of. NA: Can you describe them yet or is it a surprise? CT: My team would kill me, but I can say that it is a love letter to peppermint bark. Just everything good about peppermint bark.